Father’s Day is rapidly approaching. Have you thought about what to get your "Do-It-Yourselfer" dad? Here are a few ideas from the RockAuto catalog! Brakes Take the Stress Out of Stops and Look Fantastic Behind the Spokes of Dad's Wheels: RockAuto has Brake Kits (found under “Brake & Wheel Hub”) for everything from a '69 Chevy Corvette to an '89 BMW to a '99 Subaru Forester to a '09 Ford Expedition. Take advantage of the Power Stop Father's Day mail-in rebate and save an additional $10 or $30 on Power Stop Brake Kits at RockAuto.com through June 19, 2017. Hood Deflector Keeps Bugs and Rocks Off Dad's Paint: Protect and prepare Dad's car or truck for summer adventures with a Hood Deflector, Floor Liners, Trailer Hitch, Dash Board Cover, Running Boards and other fun upgrades found under "Accessories." Take advantage of rebates on Lund Tonneau Covers and Nerf Bars plus AVS Vent Visors and Hood Shields through June 30, 2017. Cabin Air Filter Gets Air Flowing Through Dad's Heat & Air Conditioning System Again: Cabin Air Filters (found under “Heat & Air Conditioning”), Trunk/Hood Lift Supports (found under “Body”) and Struts/Shocks (found under “Suspension”) are just a few examples of parts that fail gradually over time. Dad will notice and appreciate how the years roll back when these parts are replaced! Get a $3 rebate on FRAM Fresh Breeze Cabin Air Filters through August 30, 2017. Get up to a $120 rebate on Rancho shocks and struts through June 30, 2017. Not sure which parts or tools your dad needs now or down the road? 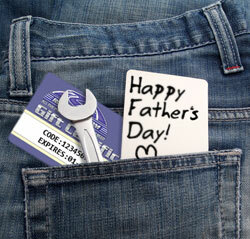 A RockAuto Gift Certificate will let your car enthusiast choose the parts or tools he needs. They are available for any amount, are easy to purchase and even easier to use!